Just thought I’d add a cool little picture of the fall color on my Beauty Berry. 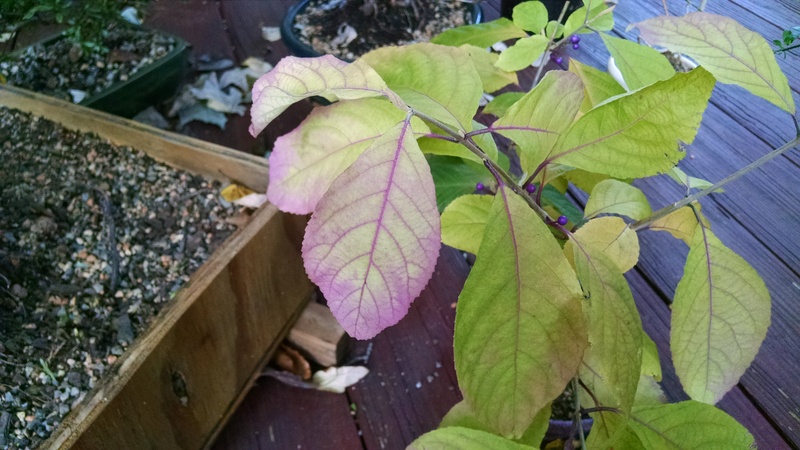 I forget the specific cultivar, I purchased it last year as a seedling online. I let it grow a few berries this year, just to see what they look like. I’ll have another photo when all the leaves are gone. 3 Responses to You Have to Love the Fall Colors. Red, Orange, Yellow…. Purple? I live in Sydney Australia, and we have coming. 28 to 37 degree! Lucky! Spring is the best time of year! Well I wanted to say! Summer is coming!